Niche line Bond no. 9 has launched Bond No. 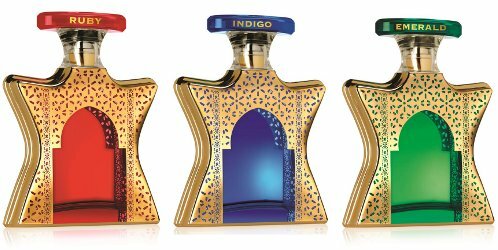 9 Dubai, a new trio of fragrances: Ruby, Indigo and Emerald. When the Empire State mingles with the premier Gulf State, the alluring result is Bond No. 9’s Dubai— a new collection of modernistic New York-inspired Arabian perfumes. Bond No. 9 Dubai Ruby ~ with bergamot, saffron, davana, rose, magnolia, geranium, amber, sandalwood, myrrh, cypriol and civet. Bond No. 9 Dubai Indigo ~ with lychee, peach, bergamot, orange blossom, jasmine, peony, white musk, amber, agarwood and oakmoss. Bond No. 9 Dubai Emerald ~ with saffron, hyssop, rose, gurjum balsam, patchouli, sandalwood, amber, cypriol and leather. Bond No. 9 Dubai Ruby, Indigo and Emerald can be found now at Harrods in the UK, £480 each for 100 ml Eau de Parfum. As this site was loading, I was yawning (it’s 6:14 am here in the Bay Area) and mid yawn I stopped and saw these bottles and said, “These bottles are beautiful!” Cannot believe my yawn stopped to do that! Hahahah! They really are beautiful, though. My goodness. Only thing that scares me is the LEATHER (Everytime I read notes on nee fragrances I chant over and over, ‘please no leather. Please no leather!’), and civet. Ha! They are beautiful. But given the price, they’d be doing you a favor if all 3 were loaded with leather. Why indigo and not sapphire?? Yeah! I had the same question. Maybe they weren’t as lucky in getting the patent for ‘indigo’ as they were in getting it for ‘peace’. Wait. Bond No. 9 has a trademark on peace? She apparently believed she did. First Bond bottles that are a love, might be worth a sniff. Don’t think I would like Indigo though, just don’t like lychee..the lychee and peony seem like perhaps they would throw it off for me. But why bother a sniff when you know the price? You know, I completely agree with you on the price making it not worth a sniff for a Bond scent. Unfortunately, I’m learning that there are other brands [cough– Amouage–cough–vintage Guerlains–cough] that somehow that reasonable logic starts to fall apart. . .
Agree I haven’t taken a huge liking to this line..why buy a bond when you can buy two Guerlains? Like everyone has said, the bottles are gorgeous, but the prices, not so much! My birthstone is the emerald, so naturally I would want that one so I could keep the bottle. But, the notes in Indigo are more appealing to me. Might try to get some samples, as I have never even smelled anything from the Bond line. Dies anyone have a favorite Bond that you would recommend me getting a sample of? Chinatown for the sheer chypre-fruity fun,New Haarlem for a great coffee-note! New Haarlem is coffee-soaked GORGEOUSNESS. Great Jones is a wonderful modernized version of an eighties men’s chypre. And I quite liked Brooklyn, Lexington Avenue, So New York, and Bleecker Street back in the day. Mind you, I haven’t smelled any of these recently: they were all fantastic five, six, seven years ago, but they could be anything by now. D’oh! I was at a Bond No. 9 counter a few weeks ago, and got a sample of Chinatown, but forgot about New Haarlem. I think Turin described it as having a lacquer note – like the inside of one of those Chinese boxes. Anyway, he was very enthusiastic about that, but it was the same element that I found off-putting! Yeah, those bottles are gorgeous, but at those prices (and at that location) they’re obviously aiming for the ungodly rich Middle East market. And Indigo is so stupid if your other scents are called Ruby and Emerald. SO stupid. Liz Taylor (or rather the marketing team) knew what was what when she did those three jewel scents. I’m wondering what those glass panels are made with? At that price better be the finest crystal! No glass panels, just a transparent coloured bottle with the gold printed around to make it look like a panel. Not as nice in the flesh as when it’s lit and photoshopped for the photo ! A number of perfume bottles have been made using the domed arabesque design, but I do like the way the motif has been adapted to fit the Bond bottle. It’s unfortunate how many bottles look better in photos than in real life. And yes, for the price one might have thought a metal sleeve was viable! Oooh no, the bottles are coloured but the juice isn’t totally clear so you’ll still see the fill level through the glass. Cheap Coloured glass bottle + gold printing + juice that costs a few pounds to make = selling price of £480 just doesn’t add up – at least Roja dove sticks a few tacky fake jewels onto his bottles to make them REALLY tacky opulent ! I find the names off-putting. A bit tacky opulent. At least there are no swarovski crystals in sight…. These look amazing! When will they be in Harvey Nichols Dubai? !